Whether you call ‘em an outhouse, a John, privy, latrine, library, crapper, head, reading room, loo, Chic Sale, office, throne room, s—house, honey pot or whatever they should be honored. Our forefathers sat in outhouses, whether they were fancy or plain…they served their purpose well. They also served as entertainment fur “teenage tuffs” in Halloweens gone by. I realize that today….outhouses are the RODNEY DANGERFIELD of the building kingdom…they just don’t git no respect. So I kinda adopted ‘em….and became a spokesman fur the lowly outhouse. For 40 years (from 1975-2014) I wrote, illustrated, and published the “Won & Only, Jenny-Wine, Accept no substitutes…..POOR OL’ GEORGE’S™ HILLBILLY CAL-EN-DUR. Each year in the calendar, I featured NATIONAL PRESERVE PRIVYS WEEK …we also called it “National P-P Week.” Thru the years, I have collected hundreds of photos, little models, and made HUNDREDS of paintings of outhouses....I'll be posting more soon! I think privies should be preserved …cause you never know when you’ll need one. Outhouses were good enough fur Prezidents Washington and Lincoln…and they should be good enuff fer us. I wanna see old outhouses saved and re-cycled. They’d make good phone booths, or a good place fur Superman to change clothes…or good school bus waitin rooms fer the kiddies, or toll booths on the toll roads…or even gondolas fer hot air balloons…or as a last resort…they’d make good coffins. Back in the 70’s my late Father, Geo. G. Borum (1913-2012) published a cartoon book of outhouses called: “The Little House out Back”…and he started making little models (a few inches to 3’ tall) of outhouses and other old time buildings. He made HUNDREDS of them..all different! 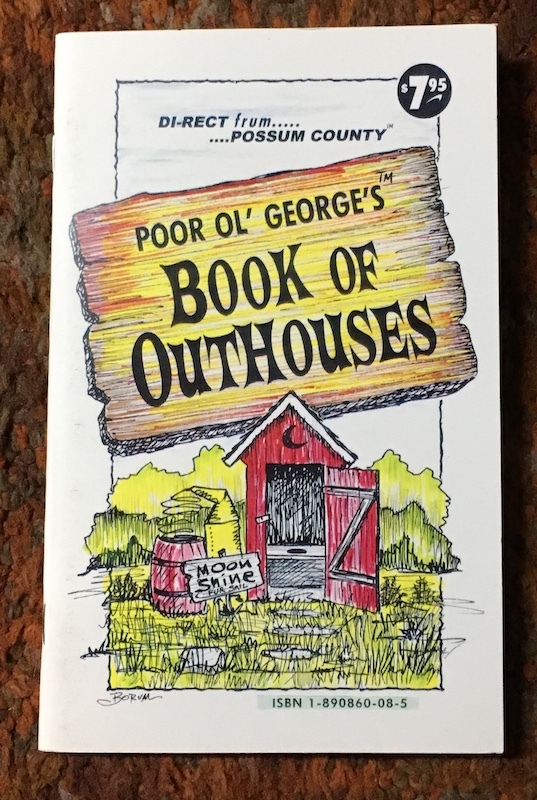 At one time he operated an outhouse museum and is in the Outhouse Hall of Fame down in Kentucky. I still have dozens of his models and will be listing them for sale on this page in the near future.